With yesterday being The Great British Bake Off finale & Nancy taking the crown. I have really enjoyed looking at the different recipes that have been floating about on social media. Check out this Famous Five Showstopper cake. The Famous Five Layer Cake, which we’re sure the whole gang would have eagerly packed in their picnic baskets. One fan has come up with an unique recipe. 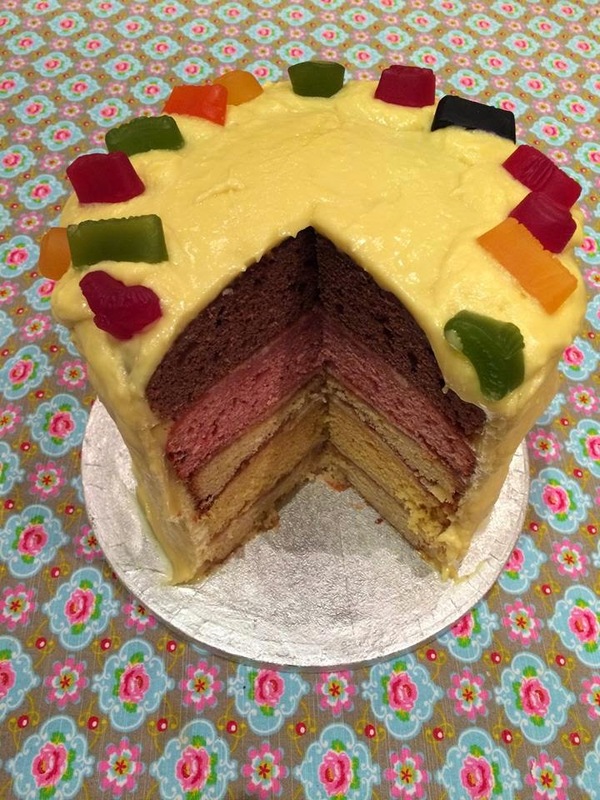 Drawing inspiration from the food and flavours that appear most frequently throughout the 21 novels, The Famous Five Layer Cake is the perfect baking treat for fans, with five delicious layers that include ginger, rhubarb, chocolate, plums and lemon. Heat oven to 190C/fan 170C/gas 5. Butter two 20cm sandwich tins and line with non-stick baking paper. In a large bowl, beat all the cake ingredients together until you have a smooth, soft batter. Divide the mixture into five – you can weigh each portion to ensure consistency of layers. You will likely have to cook the layers in batches, depending on size of oven and how many tins you have. Once in the tins smooth the surface with a spatula or a back of a spoon. Bake each layer for 25 minutes or until the cake springs back when pressed. Leave in the tin for 10 minutes to settle and then turn onto a cooling rack. Bake the remaining layers in the same way. You can transfer cooled layers to a plate and separate by grease proof paper to free up the cooling rack for new layers as they come out of the oven. To make the filling, beat the butter and cream cheese until smooth and creamy, and then gradually beat in icing sugar. Beat in custard flavoring/vanilla extract. Spread a thin layer on each layer and assemble cake in any configuration. Cover the cake with the majority of the frosting, leaving a small cup-full back for piping rosettes on the top. Keep refrigerating the cake. You may need to do the frosting in two phases – one phase to cover and then another phase to smooth with a palette knife dipped into hot water once it has hardened a little. Finish off by piping rosettes around the top of the cake and decorating with retro sweets like wine gums.